There are few authentic blues heroes still alive now, most of the original pioneers of this form of popular music have died over the last 20 years and we just have their recordings to remember them by. So thank goodness that B.B. King is still alive, actively recording and blasting out a rich stew of urban blues and jazz licks like there's no tomorrow! 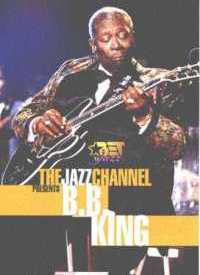 This videotape is taken from a recording for cable station the Jazz Channel and the gig begins with a blistering performance of Let The Good Times Roll. King and his eight piece band are in fine form and make a great noise, which considering the old boy is over 75 and counting is all the more amazing. The 60-minute performance includes cracking versions of Caledonia, the jaw-dropping intensity of Bad Case Of Love, Early In The Morning and a spine-tingling The Thrill Is Gone, plus several other songs. The quality of musicianship from both King (on his trusty guitar, Lucille) and his band is inspirational, and the many searing solos here prove that age hasn't made a dent yet on King's axe hero status. The TV studio setting tends to leech away a little of the excitement (relocation to a blues club would have been much more atmospheric), especially as the mixed audience tend to stay seated for most of the time, but that doesn't take away the fact that this benchmark performance by one of the all-time blues greats is a memorable one and worthy of a place in any blues fans' collection. Both picture and stereo sound quality are excellent on the tape and should be impressive on the DVD version. And, as a bonus, there is an extra section after the gig where the veteran guitarist is interviewed and shares a little of his life story.